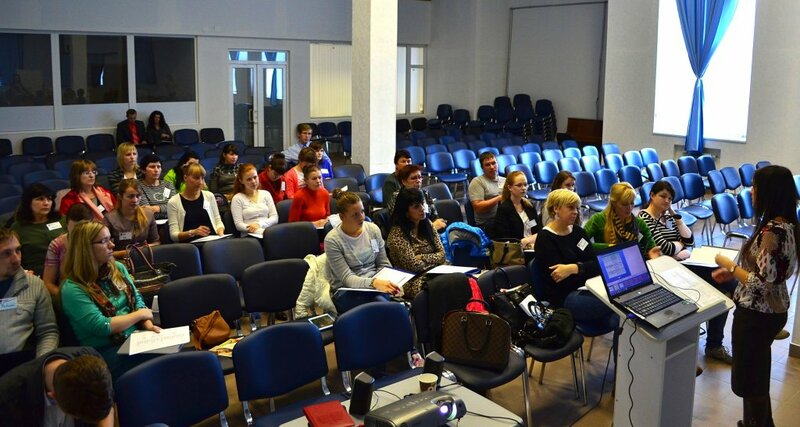 November 11-15, Agape Ministries conducted a Training Seminar in Volgograd, Russia for Christians who want to minister to orphans and other at-risk children. The seminar was taught by a team from Agape Ministries, Ukraine. The seminar was held in “Light to The World”, a Christian Cultural Center. More than 30 people attended, from Volgograd, Volzhsk, Kirovo-Chepetsk, and Saransk (Republic of Mordovia). It was a great experience for all involved. You could feel the love, mutual repect and acceptance present in the hall as the seminar teachers and attendees interacted. People got to know one another, some sharing ministry experience gained over the years, others sharing their first steps in orphan ministry, and yet others tried to take in all the conversations simultaneously, planning to soon take their own first steps in ministry. It was a blessing for everyone there to see so many others interested in the same kind of ministry and to get to know each other. It was no less of a blessing to be able to take in the valuable teaching covering: the Psychology of an Orphan Child; Psychology of Different Age Groups; Teen Ministry, and Ministering as Team. The Agape team from Ukraine also brought the Bible Lessons Curriculum that Agape has developed for working in orphanages. This consists of three different age-appropriate curricula sets for small children, school-age kids, and teens. They not only presented this curriculum to the seminar attendees, giving each person their own set of materials, but also held demonstration lessons of how these materials could be used in orphanages. The team from Ukraine was also able to visit the museum of The Battle for Stalingrad. It was a very emotional experience, as they stood under the high, domed roof of a huge diorama depicting those awful events of WWII, listening as the tour guides shared the amazing and horrible stories of the tremendous battle that raged in what is now the city of Volgograd. If only we could find soldiers as brave and fearless as those in that battle of 1943, soldiers to take up the challenge of orphan ministry. We want to see this burden, this desire to go forward into spiritual battle take the churches of Ukraine and Russia by storm, growing into a nationwide effort to take the victory of Christ over sin and death into every orphanage in our country. Our Heavenly Commander leads us in this battle - He is, after all, not only our Father, but the Father and Defender of all orphans.